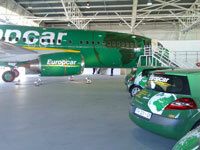 Europcar are offering a free day special for car rentals checking out on or before 31 January 2010. Rent for 3 days and only pay for 2. Europcar’s giving one day free rental when you rent with them for a minimum of 3 days and a maximum of 7! Rates vary by region. Valid for car rentals checking out on or before 31 January 2010. This offer applies to rentals in Gauteng and Free State Regions; standard rental Terms & Conditions apply; valid for credit card rentals only; vehicles subject to availability. Rentals of less than 3 days cannot be booked under this special. Book at Europcar South Africa.